Like an NFL referee, Rep. Vincent J. Candelora, R-North Branford, is throwing a flag, saying that Democrats committed the legislative equivalent of having too many players on the field. 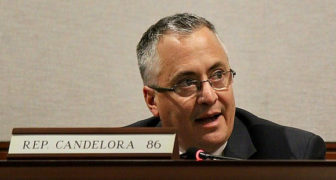 Candelora said Tuesday that Democrats placed one too many senators on the legislator’s Transportation Committee after assigning Sen. Derek Slap, D-West Hartford, to the panel after his recent victory in a special election. Legislative rules limit the panel to nine senators, and Slap made 10. In Candelora’s view, that means that the committee’s approval last week of three bills authorizing the state Department of Transportation to pursue highway tolls are invalid. If they come before the House for a vote, Candelora said he will object. “I will challenge them,” said Candelora, the deputy minority leader in the House. Candelora made his complaint in a letter to the House Speaker Joe Aresimowicz, D-Berlin, and Senate President Pro Tem Martin M. Looney, D-New Haven. There were 10 senators on the committee last year, and no one objected. “We don’t think there is an issue here,” Looney said. The legislature operates under Mason’s Manual, which effectively says passage by the Senate or House trumps any procedural defect in a bill. Looney said any of the bills can properly come before either chamber. The Transportation Committee’s deadline for acting on legislation was Monday. Candelora acknowledged that wouldn’t mean tolls were dead as an issue, even if the legislative leaders agreed with his view of the rules. The Finance, Revenue and Bonding Committee has legislation that could be amended as enabling legislation on tolls, he said. That committee’s deadline is not until May 2. “There certainly is a vehicle out there,” he said. The Connecticut General Assembly has joint committees of the House and Senate. Under the rules adopted this year, most committees can have a maximum membership of nine senators and 35 representatives. The exceptions are the Judiciary Committee and the two money committees, Appropriations and Finance. Even with limited funding, Connecticut can do a lot to improve its rail infrastructure without spending too much money - and can adopt quite a few policies that will create some room for additional investments. To achieve this ConnDOT, Amtrak, and Metro-North will have to adopt some significant changes on how they run their railroads, build infrastructure, and purchase equipment. How bad has service gotten on Metro-North? Ask Chris Golier, a 40-something family-man from Fairfield who rides the train daily from Southport to Grand Central. “Commuting is a soul-sucking exercise,” he says. What used to be a 60-minute ride to and from NYC, now takes 75 minutes. And though slower than in years past, his trains are rarely on time… not the 88 percent on-time performance claimed by the railroad, but more like 37 percent.” How does he know? He kept a log. As if crumbling bridges and pot-holed highways weren’t enough to worry about, now America’s transportation network is facing a new crisis: a shortage of truck drivers. According to the American Trucking Association (ATA), trucks carry more than 70 percent of all domestic freight, bringing in $719 billion in revenue. It’s trucks, not trains, that deliver our Amazon purchases and fill the shelves of our favorite big box stores for the holidays. So while we hate to drive behind them on our highways, we love what trucks deliver.